The police have invited Senate President, Bukola Saraki over 5 April multiple bank robbery in Offa Kwara state, during which 33 persons, including nine policemen, were killed. Police spokesman, Jimoh Moshood also announced the arrest of Mr. Yusuf Abdulwahab, the chief of staff to Governor Abdulfatah Ahmed and Alabi Olalekan, his Personal Assistant, Political, as investigations over the gruesome robbery deepened. The police claimed five of the bandits arrested and who have made confessions during interrogations indicted the senate president. The police therefore wanted to interrogate the senator, who is Number 3 person, in the order of protocol in the country. The police did not give a specific time they wanted Saraki to report. 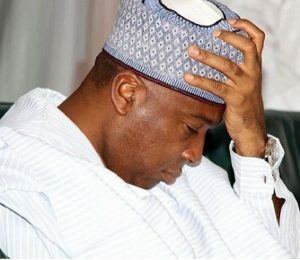 “The Senate President, Sen. Bukola Saraki is being invited by the Nigeria Police Force to report to the Force Intelligence Response Team office at Guzape, Abuja to answer to the allegations levelled against him from the confessions of the Five (5) Gang Leaders, namely; Ayoade Akinnibosun, Ibukunle Ogunleye, Adeola Abraham, Salawudeen Azeez, Niyi Ogundiran and some of the other Seventeen (17) suspects arrested for direct involvement and active participation in the Offa Bank Robbery and the gruesome killing of 33 innocent persons which include some pregnant women and nine Police personnel”, Moshood said. The police in the statement appeared to have dropped hints on what they wanted to ask Saraki about, as they claimed that the five men, who were the leaders of the bandits `’admitted, confessed and volunteered statements that they were political thugs of the Senate President, Federal Republic of Nigeria, Sen. Bukola Saraki and the Executive Governor of Kwara State, Alh. Abdulfatah Ahmed”. The other hints dropped were the recovery of one Toyota Prado Jeep with Reg. No. 19KWGH belonging to the Personal Assistant, Political to the Governor of Kwara State and a Sticker plate number with inscription “SARAKI” “Kwara, State of Harmony”. “A Lexus jeep GX-300 (Ash Colour) with a sticker plate number with inscription “SARAKI” “Kwara, State of Harmony” used by the gang leader (Ayoade Akinnibosun, during the bank robbery and the killing of the 33 innocent persons was taken to Government House, Ilorin on 16th May, 2018 where the sticker plate number with inscription “SARAKI” “Kwara, State of Harmony” was removed before another plate number (Reg. No. Kwara, KMA 143 RM) registered in the name of Ayoade AKinnibosun the Overall Commander of the Offa Bank Robbery was then attached to the vehicle to cover up the identity of the said vehicle. “The exhibit vehicle was subsequently recovered from the premises of the Min. of Environmental and Forestry in Ilorin, Kwara State. While the sticker plate number with inscription “SARAKI” “Kwara, State of Harmony” removed from the vehicle was recovered from one Adeola Omiyale who drove the said Lexus Jeep to Government House, Ilorin immediately after the Bank Robbery. “The Personal Assistant (Political) to the Executive Governor of Kwara State, Mr. Alabi Olalekan, who is privy to information that the Police is looking for the Lexus Jeep as an exhibit used in the Offa Bank Robbery… directed one Adeola Omiyale to relocate the Lexus Jeep to Government House, Ilorin. The PA (Political) is currently in Police custody and has made useful statement assisting the Police in further investigation into the case. “A revolver pistol and pump action gun were recovered by the Police Investigation Team from the Personal Assistant (Political) to the Executive Governor of Kwara State, Mr. Alabi Olalekan’s Farm where he directed his brother to hide them after his arrest by the Police. “In order to conceal evidence, the Chief of Staff to the Executive Governor of Kwara State, Mr. Yusuf Abdulwahab who has been arrested and taken into Police custody, arranged the removal of the sticker plate number with inscription “SARAKI” “Kwara, State of Harmony” from the exhibit vehicle. The police gave an assurance that they will continue to ensure that the rule of law prevails in every case under investigation and every offender is brought to justice. First Bank Offa (ii) Guaranty Trust Bank Offa (iii) ECO Bank Offa (iv) Zenith Bank Offa (v) Union Bank Offa (vi) Ibolo Micro Finance Bank Offa and (vii) the Divisional Police Headquarters, Offa on 5th April, 2018.